Q. My lawn has a heavy layer of thatch. Is there anything I can use to encourage it to decompose? Does this mean I am over-fertilizing? Q. And dug out from our "a little old but too good not to answer" file, Jonathan in Kearney, Nebraska wrote way back in 2014: "I have a mulching mower and always leave my clippings on the lawn as you and others have recommended. But my yard has a lot of brown spots where it appears thatch is keeping new grass from coming up in the spring; and my state Extension office has said that people should pick up their lawn clippings to avoid thatch. What's the story? Is there something I need to do to avoid thatch if I use a mulching mower?" A. The answer to Gayle's second question is yes; the biggest cause of thatch is overuse of chemical fertilizers. Luckily, some states—like Virginia and Maryland—are going to kind of 'accidentally' reduce the incidence of thatch in lawns in their region thanks to new laws that limit the amount of food you can apply to a lawn at any one time and how often you can feed. …and leaving the clippings on the lawn in between feedings—because Jonathan's Extension service warning that clippings cause thatch is an old and disproven myth. On average, grass clippings are 10% nitrogen and 90% water (the two biggest things lawn grasses need besides sunlight). Leaving the clippings on the lawn creates a rich moist environment right at the soil line, helping to colonize the area with billions of little microbial helpers who break down dead organic matter like thatch. And I think that Jonathan has a bad diagnosis. As our go-to lawn care expert, Iowa State University's Dr. Nick Christians explains, thatch is a layer of dead material underneath a layer of green. Patches of entire brown would more likely be the result of a disease like brown patch, 'spring dead spot', summer patch or one of the snow molds. Jonathan's Extension service can redeem itself here by providing the exact identification. Let's take a VERY short detour into those diseases. Interestingly, all of them begin with thatch and over-use of chemical fertilizers, so caring for the lawn correctly should prevent them. (How's that for terseness?!) One timely addition for avoiding the snow molds is to keep mowing until the grass stops growing and don't leave any whole leaves on the lawn over winter. But, we repeat: all 'patches and thatches' start with overuse of chemical fertilizer. 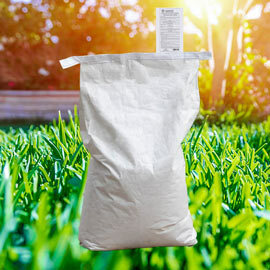 Especially cheap, quick-release high nitrogen fertilizers, which are also the worst for your soil and its life. Now back to our main topic. Nick surprisingly states in his classic book 'Lawns', that "a little thatch is good". (We're talking a half-inch or less.) Nick explains that "a shallow layer of thatch acts as a natural mulch to retain moisture, lower soil temperature and discourage germination of weed seeds. The decaying plant material" he continues, "even adds nutrients back into the soil." 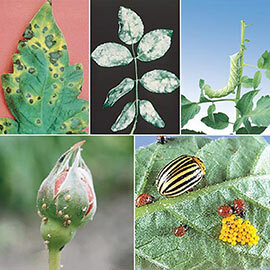 The problem occurs when over-fertilization creates more of the stuff than soil microbes can break down. Nick also cites the dreaded frequent short waterings as a cause of thatch. So follow our lawn care 101; feed lightly and at the correct times of year; leave your clippings on the lawn; and when you have to water, only do so deeply and infrequently. That alone will often get rid of thatch. But in some cases, direct action is called for as well. Core aeration—pulling little plugs out of the lawn to reduce soil compaction—is the best way to get rid of existing thatch. And it's great for the overall health of your lawn! And aeration is often that one big overlooked thing that holds you back when you're doing everything else right. Nick says that homeowners should aerate high traffic areas and lawns in heavy clay soil every year or two; and that every lawn will benefit from an aeration every five years. Cool-season lawns should be aerated in late summer/early fall—after the heat stress of summer is over but a solid month before freezing temps arrive. 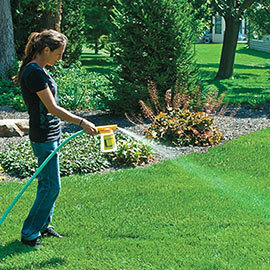 Warm-season lawns should be aerated after they green up, but before summer becomes oppressive. "After the second mowing" is a good rule, he notes. There's also a technique known as "dethatching", aka "power raking". But both techniques, while good for the long-term health of the lawn, stress it temporarily and Nick warns that you should not attempt both in the same season. He strongly prefers core aeration; which he notes is less stressful, especially on Southern lawns.